Mom's everwhere can relax! Planning the perfect Princess Party for your sweet Princess is made simple (and more than affordable) by My Princess Party To Go ! With several complete party package options to choose from, your little princess (or prince~there are boy dress up packages available as well) can have a memorable magical party of their own! 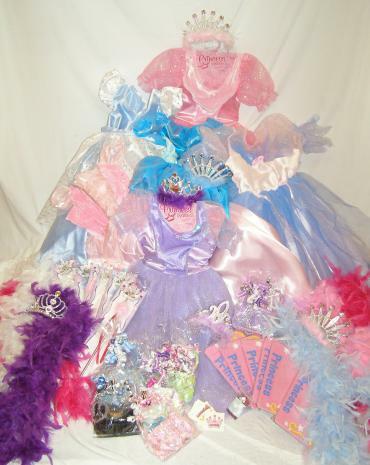 ~8 Assorted Princess Dresses (Choose any 6 dresses currently in stock on our Princess Dress Page). While browsing MyPrincessPartyToGo.com , I was genuinely taken back by their more than reasonable pricing. Whether it be a party that I've planned for the Princess or B - the cost has always far exceeded the pricing on the complete party packages that are offered by MyPrincessPartyToGo.Com! While the parties were fun, they were nothing like a My Princess Party To Go Party! How nice is it to have a beautiful dress for each of the girls attending?! 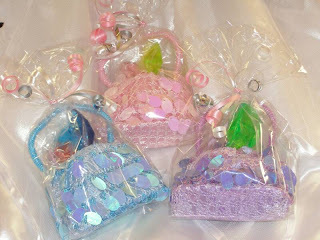 They can dress up at the party, and then can take them home (along with the beautiful purse & accessory goodie bags!). We will be having a huge bash in January for the princess's birthday; we're attending the Disney on Ice: Princess Classics show in our area. Her guests will each receive a beautiful dress to wear for the show, and a special "goodie purse" to take home. There's no question about it, My Princess Party To Go offers ease, quality, amazing value, and FUN in the form of their complete party packages! Every little princesses dream party....delivered right to your door! Experience the ease, quality, value, and FUN! of MyPrincessPartyToGo.com COMPLETE Party Packages! One Lucky Reader will receive a $150 Gift Certificate (Plus Free Shipping!) to MyPrincessPartyToGo.com ! Leave a Comment~ Visit http://www.myprincesspartytogo.com/ and let me know which complete party package you would love to have for your child's next celebration! The comment is considered your entry. I like the glamour princess package! I want to do a big tea party for my daughter and all her little friends! I'm a public follower. I would love to have the Deluxe Princess and Pirate Party Package. What a fantastic idea!! I'd love to have a prince and princess party! I would like the Glamour Princess package for my niece, thanks! I think I'd have to go for the deluxe package. This is the cutest idea for someone to come up with! Oh my gosh lol!!! I'd love the Princess & Knight Birthday Party Package for my Daughter's 3rd Birthday!! The pretty in pink set is terrific and my niece would love it! I love the pretty in pink package. I am a new follower. I follow on GFC and would select the Pink Princess & Crown Prince Party because I have boys and girls at all our parties it would work out that everyone would have a good time! Do they have a dragon set for my husband to wear? I would love the Princess & Knight package. My son would love a toy sword. Lol. I would love to have the "Glamour Princess"